Vintage Singer 10hp two-seater at Parker's garage in Bolton and Manchester, 1924. Homepage. This page: Papers from 1924 describing the sale of a two-seater Singer 10hp motor-car at Parker's garage. Sale of a Singer 10hp motor-car in 1924. In June 1924, Mr Robert France of Stopes Road in Radcliffe, called into the premises of Parker's (Automobile Factors and Engineers), and agreed to purchase a secondhand 10hp Singer two-seater, fitted with dynamo and starter. The purchase price for the Singer 10 was £184.17s.0d, including fully comprehensive insurance (for which £9.17s.0d was charged). The date was June 6th, 1924, and the car's registration BN 6839 (a Bolton issue). Secondhand cars were also sold from their premises, as the paperwork for the Singer demonstrates. In addition to being a member of The Motor Trade Association, Parker's was also signed up as an official Auto Cycle Union Repairer. 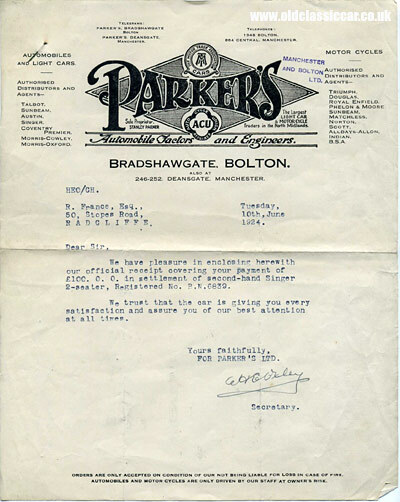 Four days later, on 10th June, Parker's wrote to Mr France once more, confirming that they had received the final settlement of £100 for the purchase of the used Singer, and hoped that he was gaining satisfaction from his purchase. Shops and eateries now occupy the Manchester Deansgate address for Parker's Ltd. 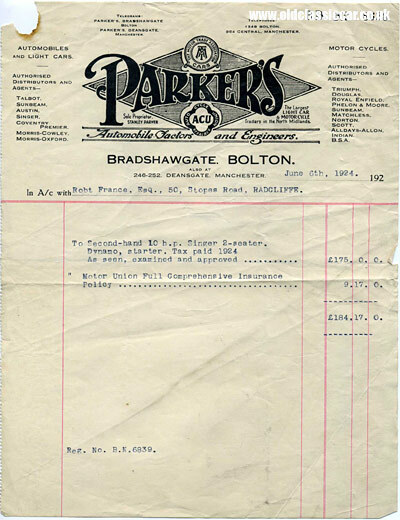 The Bolton Museum's site has a photo on this page of a Parker's garage, taken in 1947. However I think this is a different location to the one referred to in the documents shown above, but it's a really nice photo so worth mentioning anyway. Outside the premises is a car being worked on, and a Fordson E88W lorry. A reference on another site suggests that the town's current BMW garage is now on the site of the former Parker's Ltd garage, on Bradshawgate. In 1940 the garage would be in the spotlight for all the wrong reasons, as a (still unsolved) murder was committed behind Parker's garage, in November of that year. I don't have a photo of a two-seater Singer 10 of the type referred to here, although this page does feature a number of four-door vintage Singer Tens, similar in style to Mr France's automobile. Two years after buying the Singer, Mr France part-exchanged it against a brand new 12/20 Calthorpe touring car.